It is commonly known that your body requires a balanced diet in order to grow and function well, but many women do not realize that this is also important for your hair. If you do not consume enough protein, fats, carbohydrates, and vitamins and minerals, your hair is likely to suffer. Specifically, several types of vitamins are needed - each for different reasons. Below, find a short guide to help you understand why these vitamins are important. 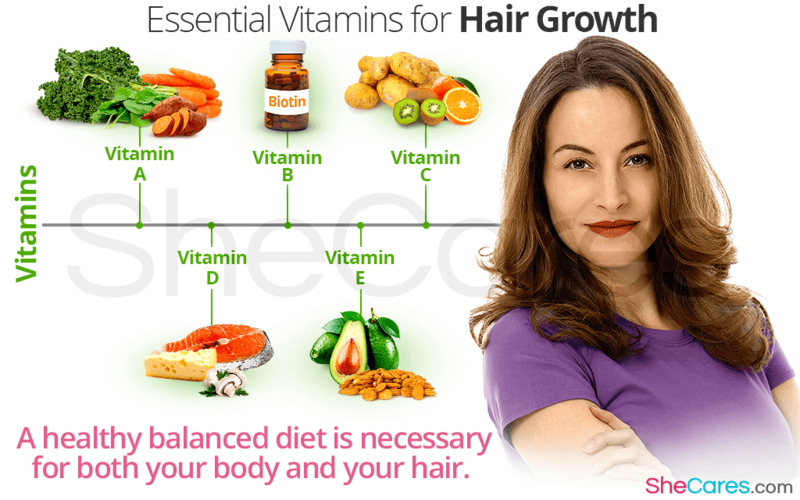 Vitamin A is necessary for the healthy growth of cells in the body, which includes those in the hair follicles. It is also used on the scalp to enhance the production of a substance known as sebum. Sebum is the natural oily substance that the hair needs to maintain health and strength. This vitamin can be acquired from many fruits and vegetables, such as carrots, kale, spinach, and sweet potato. One vitamin in the B-vitamin group, referred to as biotin, is particularly famed for stimulating hair growth. Biotin encourages the production of amino acids by breaking down proteins, a process that is required for hair which is predominantly comprised of protein. There are several different concentrations of biotin supplements available; however, care should be taken not to exceed the recommended daily intake of 2.5 mg. This nutrient is widely associated with its benefits to the immune system, but actually, vitamin C (i. e; ascorbic acid) is used by the body in a number of other ways. With regards to hair, it is required to enable the absorption of iron, a mineral that is necessary for inhibiting hair loss and encouraging growth. It is present in a large number of fruits and vegetables, including oranges, potatoes, and kiwi. The most well-known source of vitamin D is sunlight; however, it is also possible to obtain it from foods such as fish, cheese, and mushrooms. Research has shown that vitamin D is helpful for maintaining the health and functionality of hair follicles, which means the growth of new hair can occur in abundance. There are several products containing vitamin E that are marketed for stimulating hair growth, as well as for the general support of healthy hair and nails. It is thought that it has the ability to widen blood vessels, and therefore improve circulation. Increased blood flow to the scalp is thought to be able to enhance the activity of hair follicles. Vitamin E can be obtained from leafy green vegetables, almonds, and avocados. With a sizable list of beneficial vitamins to choose from, it can be hard to know which one. Armed with some information about why these vitamins are important for hair loss and for stimulating hair growth, you will be able to acknowledge the importance of a healthy diet and incorporate wholesome foods into your daily meals.